You will be routed to the NSH Professional Services billing site. We are available to see patients upon referral from their primary care or specialist physician or surgeon. 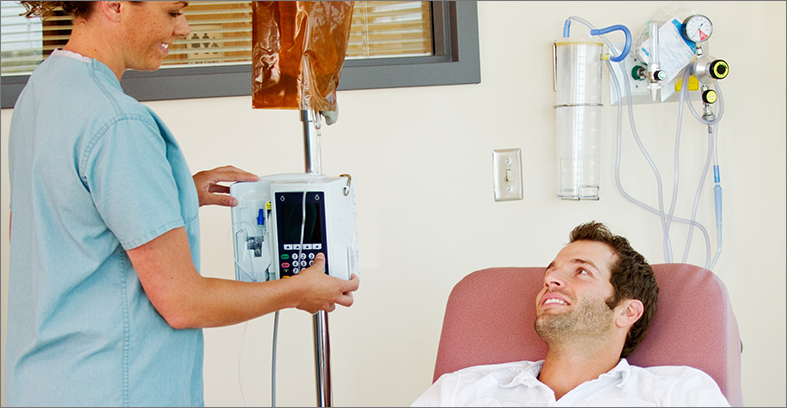 Same day or next day appointments are available to patients with urgent problems. Please have your physician contact our practice directly. At Atlanta Clinical Care, our team of infectious disease specialists is dedicated to offering the highest level of service to our patients and to their families. We strive to provide comprehensive and compassionate medical care. Each of our four physicians is board certified in internal medicine and infectious diseases. They are on staff at Saint Joseph’s Hospital and Northside Hospital Atlanta and Forsyth. Dr. McMillen is a graduate of the Medical College of Georgia. He completed both a residency in internal medicine and a fellowship in infectious diseases at the Medical College of Georgia in Augusta. 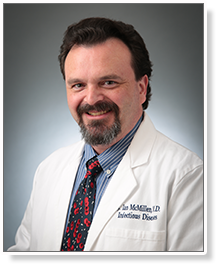 Dr. McMillen is a Member of the Infectious Diseases Society of America. He currently is the chairman of Emory St. Joseph Hospital’s Pharmacy and Therapeutic Committee. Dr. McCall graduated from Temple University School of Medicine in Philadelphia. 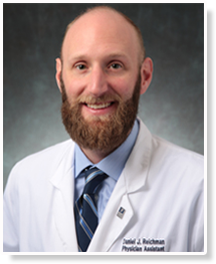 He completed a residency in internal medicine at the Western Pennsylvania Hospital in Pittsburgh, where he was chosen to serve as Chief Resident in Medicine. Prior to moving to Georgia, Dr. McCall completed a fellowship in infectious diseases at the University of Alabama. 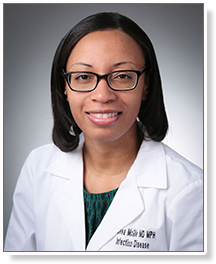 Dr. McGhie is a graduate of Howard University School of Medicine in Washington D.C. She completed an internal medicine residency at the RW Johnson School of Medicine in New Jersey and received an MPH from The John Hopkins University. Prior to moving to Georgia, Dr. McGhie completed a fellowship in infectious diseases and served as Assistant Professor at Texas A&M University. She is a member of the Infectious Diseases Society of America. Dr. Lee is a graduate of Chicago Medical School. 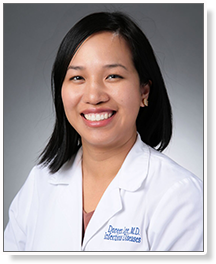 She completed an internal medicine residency at New York University Medical Center and a fellowship in infectious diseases at Montefiore Medical Center in New York. Prior to moving to Georgia, Dr. Lee served as an instructor in Medicine at Albert Einstein College of Medicine in New York. She is a member of the Infectious Diseases Society of America. 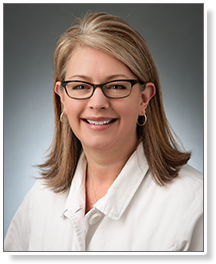 Ms. Usherwood is a certified physician assistant with over twenty years of experience in infectious diseases. She received her undergraduate degree from Davidson College in North Carolina, and graduated from the Emory Physician Assistant Program. Mr. Shields is a certified nurse practitioner. He received his nursing degree from Piedmont College and completed his advanced practitioner degree from Mercer University. Casey joined our practice with a background in emergency medicine. Mr. Reichman is a certified physician assistant. 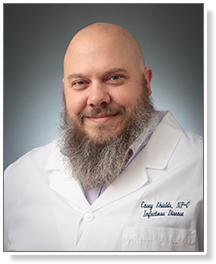 He received his undergraduate degree from the University of Vermont, his Masters in Public Health at Rollins School of Public Health at Emory University and also graduated from the Emory University Physician Assistant Program. 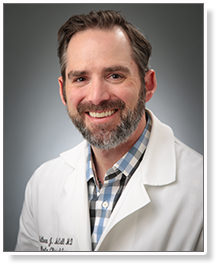 Dan joined our practice with a research background in diarrheal diseases, tuberculosis and HIV medication regimen complexity. He has a strong interest in HIV and Travel Medicine. © Atlanta Clinical Care, LLC 2019. All Rights Reserved.